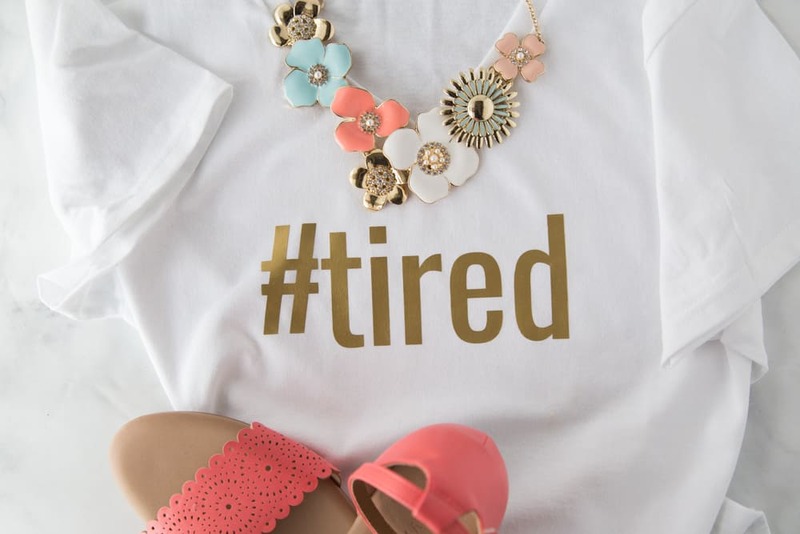 You will love this easy DIY T Shirt! 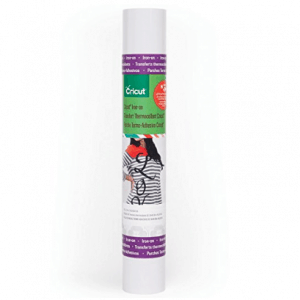 It is completely customizable, super fun, and can fit any mood. I am so excited to share today’s project with you guys! If you follow us on instagram then you know that Sarah and I just got back from the Cricut Mountain Make-a-thon where we taught a class all about the art of the DIY T Shirt! 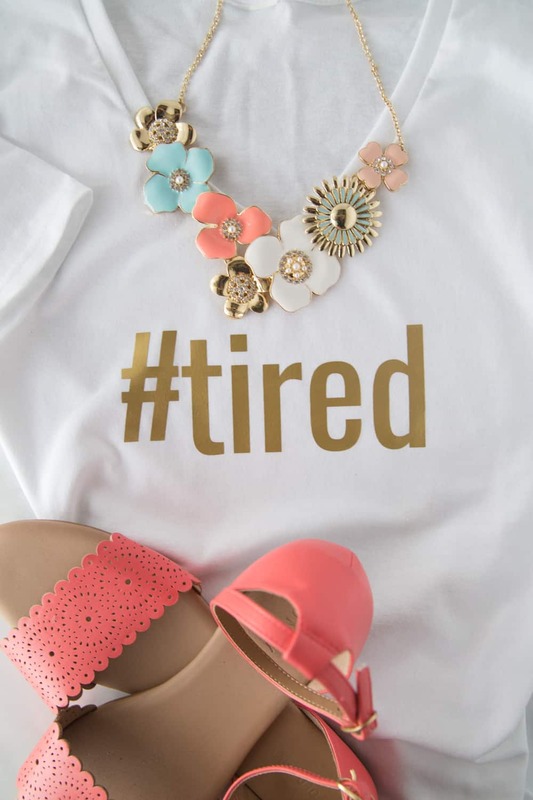 I mean, who doesn’t want to be able to customize a t shirt to say exactly what you want it to… am I right?! All the good vibes over the weekend made me a little nostalgic about my very first project I ever made on my Cricut Explore, which was this super easy DIY Hashtag T Shirt! I posted it on the blog over four years ago, and boy was it in need of an update! The good news is, I can truly attest that I still have that shirt four years later and it has washed and worn so well! Before we dive into the updated tutorial on how to make your own easy DIY T Shirt, how about a little video tutorial to walk you through how it’s done?! You guys. If you have never used a Cricut Machine before you will die over how freaking easy they are to use! I remember I was so nervous to break out my machine for the first time, and once I did I couldn’t stop! 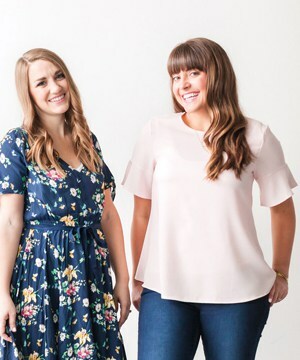 I started with a #bold shirt for my little Nora bean and I loved it so much that I had my BFF’s come over for a girl’s night to make some too! That’s when I created this #tired one for myself! 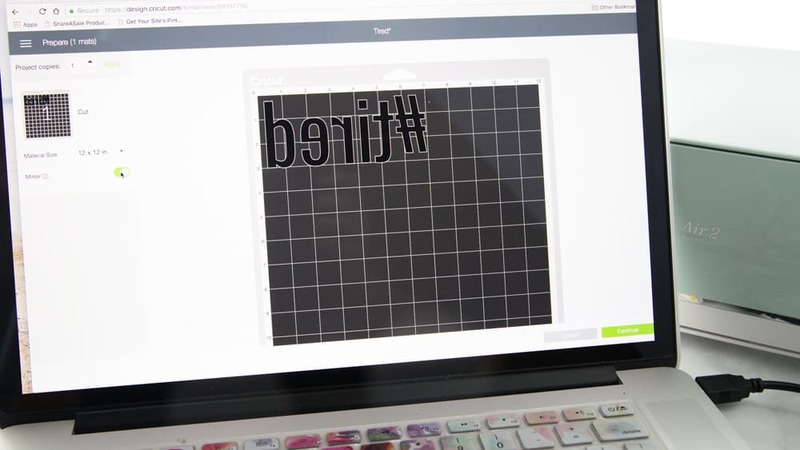 Okay are you ready to make your own DIY #hashtag shirt?! Let’s do this! 2. 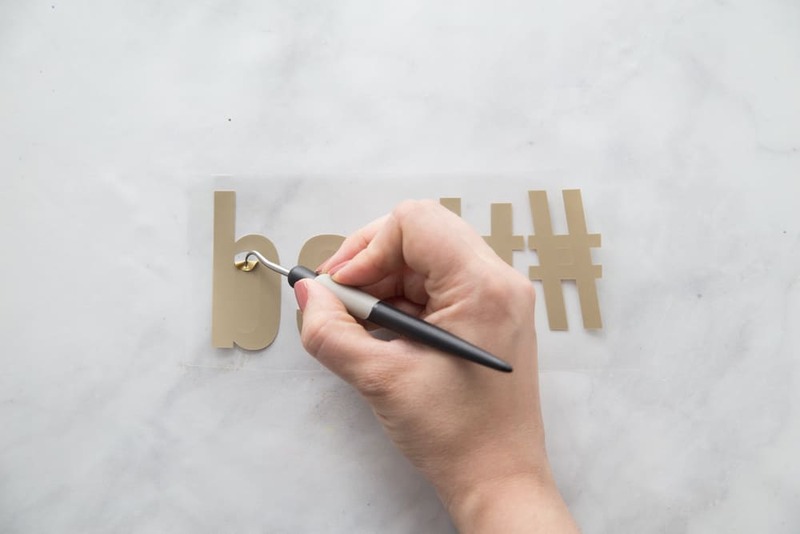 To design your hashtag t-shirt, all you do is go to the Cricut design space and click “create new project” then “add text.” Type your #hashtag and then pick a font and sizing. For Nora’s baby shirt I kept the width at 5.5 inches, and for my adult DIY T shirt I set the width to 8.5 inches and the height to between 2-3 inches. 3. After you have the sizing and font set how you like them click the “Make It” button. Don’t forget to select the “mirror” option so that your design will turn out right on your t-shirt! The screen should look like this after you mirror your image. 4. 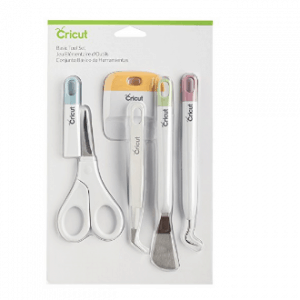 Cut your design! Click on the green continue button and follow the prompts for loading your iron on vinyl into your machine. Make sure you place your vinyl on the mat SHINY SIDE DOWN. 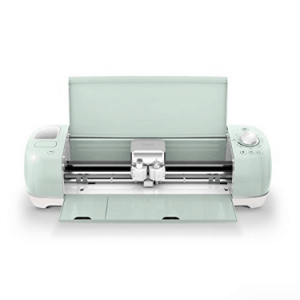 Follow the prompts to load your mat onto the machine and then push the “go” button and the Cricut will cut your image! I cannot stress enough how easy this was. I was seriously so afraid of it, and the machine basically does all the work for you! 5. After your word is cut, weed out the excess Iron-On, and stick it onto your t-shirt where you want it. 6. 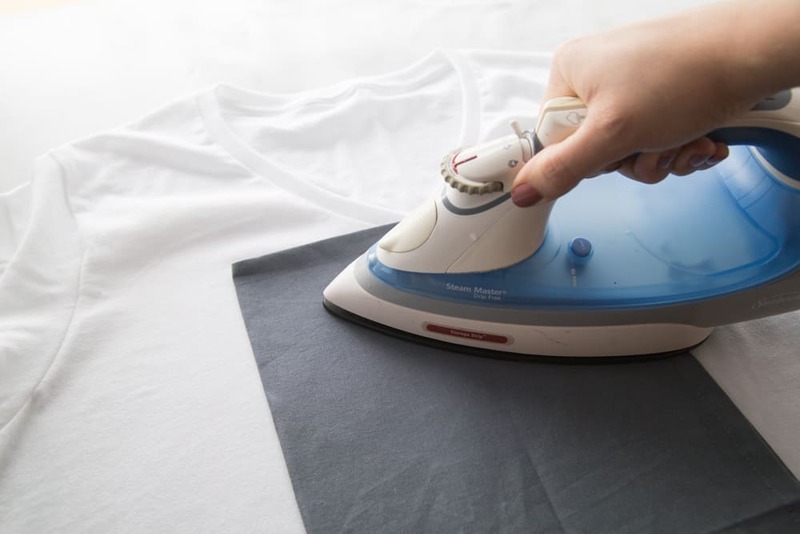 Heat for thirty to sixty seconds with iron on cotton setting (make sure your steam setting is turned off on your iron) and place a thin towel over the plastic before heating with your iron. 7. Lastly, flip your shirt over and heat from the back for 30 additional seconds. So simple, yet so fun! 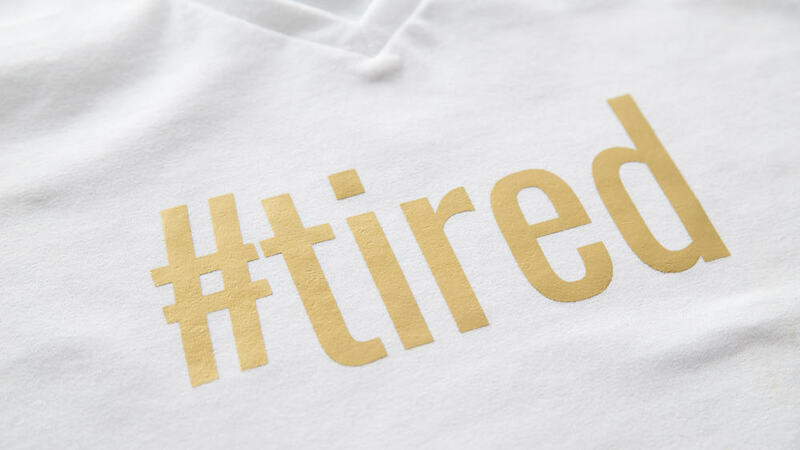 I gotta tell you, I love my #tired tee. For some reason it just totally makes me smile! Probably because it’s so true to my life stage right now. 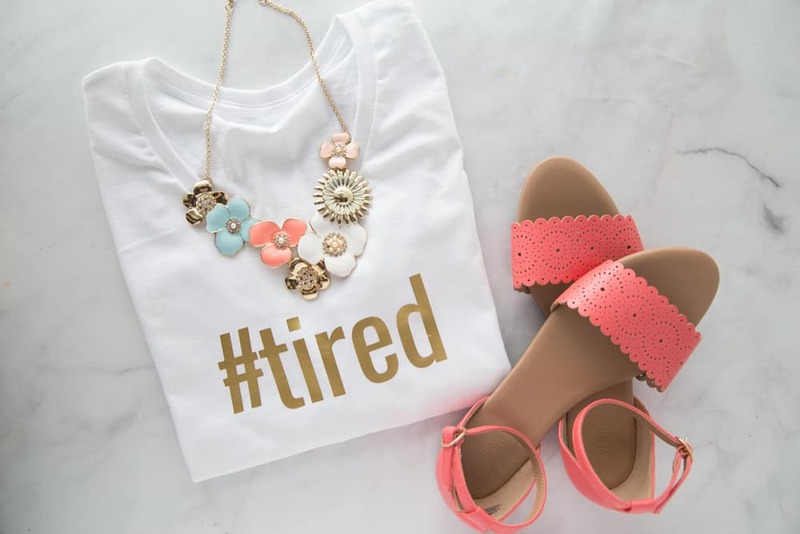 It’s a perfect shirt for lazing around at home, or for a morning when you woke up late with your favorite jeans and some cute gold flats. I wore this to the grocery store toting around my four babies and I can’t tell you the smiles I got from people, haha! 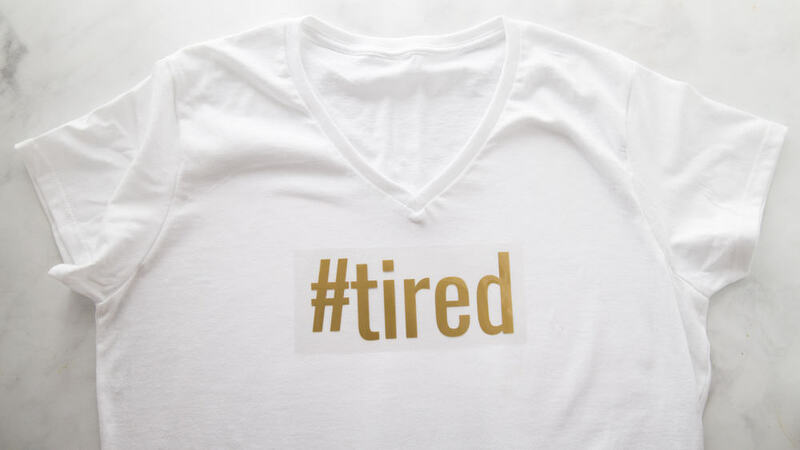 I hope you all have fun making your own #hashtag tees! What would you have yours say? What font did you use for the #babymama shirt? This is a great idea! Is it washable? Will it crack overtime? I’ve washed mine multiple times and still no issues or cracking! I do wash it inside out and hang dry it just to be safe! Look how happy your bold little girl is! Such great hashtags for everyone! Go Team Lucky 13!! Aww thanks so much! She definitely makes me smile!! Hey Jessica. Its Kiki(from Alta High School) I hope you remember:) I secretly love blog-stalking you! I think this is such a cute shirt. I don’t have a Cricut but is there any way to beg you to ship the iron on words?! I would totally pay you and send you a check before you even started! Anyways, just curious! Let me know! Of course I would love to! Send me an email and let me know exactly what you want to Jessica.prettyprovidence@gmail.com!You are so nice to follow along! How are things going with you?! These are SOO cute Jess! I love the gold glitter letters and I want to make one for baby girl!! What would we do without the Cricut?! I would love to make one for baby girl!! I cannot wait to meet her!!!! Jessica – They turned out AMAZING!! Seriously – love them!! Good work lady! Aww, thank you so much Pam! That really means a ton!